As I’ve mentioned before, I had a very Christian upbringing until I was 12. I have been saved (more than once) and was even Baptised as an adult. We celebrated a very traditional holiday season. Now that I’m an adult without many family ties, what is the holiday shaping up to be like at our house? I decided around Thanksgiving that I wasn’t going to celebrate Christmas, that we would celebrate Yule, and that was it. 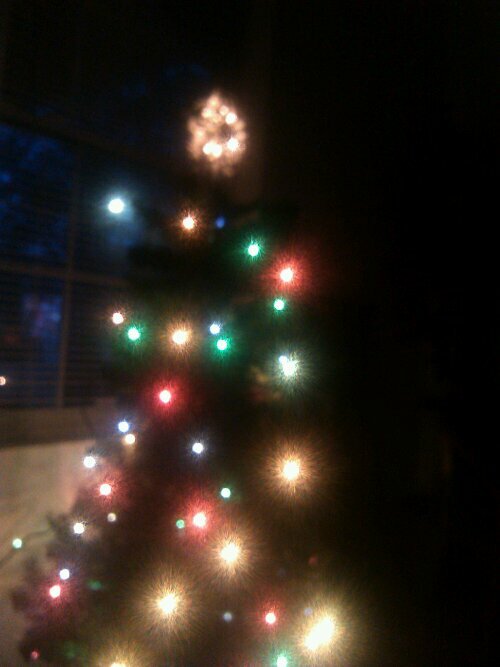 As the Yuletide season closed in, we put up our Yule-tree, which looks suspiciously like a Christmas tree. Planning the dinner menu, which was supposed to be held on Yule but we’ll be spending 5 hours in the car tomorrow picking up Mini-Me — so it’s looking more like Sunday, it was a unanimous decision that it would stay the same since traditional Christmas foods and traditional Yule foods are pretty much the same. Gifts between Draco and I were small and exchanged today. Mini-Me will get hers when we get home tomorrow night, on Yule. So, what’s so different other than the date? Not much, actually. If the wind dies down (it’s really going here right now) we plan to have a bonfire and a small, informal ritual. That’s pretty much the only difference. Much of our religion is like though since many Christian traditions and symbols were absorbed from the Pagan cultures when they were attempting to convert them to Christianity. (Ever asked yourself what dying and hiding eggs and bunny rabbits had to do with the resurection of Christ? They don’t. Those are Ostara/Eostra customs). Just like decorating a tree doesn’t have much to do with Christ’s birth. Next year, I plan to take Yule in a more rustic direction, but I just didn’t have the financial means to buy stuff this year. Maybe between now and then I will think up some creative ideas for incorporating more Yule traditions. What is Yule/Christmas looking like at your house? Stasha (@PonderingMama)Hey. I am trying to catch up with what I have missed given the hell that has been this past week. .
A Little writing, a little witchery...nothing like it!